What’s Happening in Birmingham this July 2018? 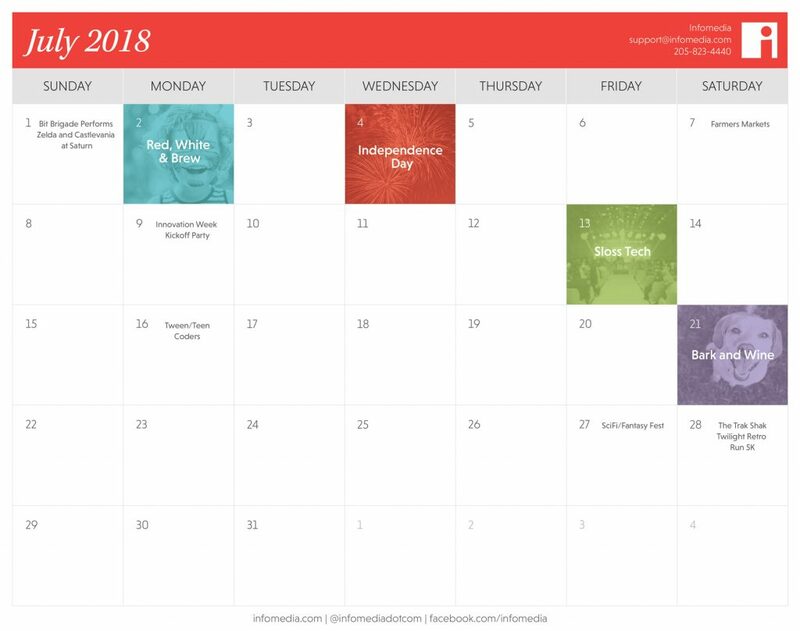 Find out with Our Free Calendar | Infomedia, Inc.
We’ve made it through half of the year, and it’s time to celebrate. Summer-based events are everywhere in Birmingham during July, and our free downloadable calendar features the best of the best. Spend your weekend purchasing perfect local produce at Pepper Place Market or discussing Game of Thrones theories at the SciFi/Fantasy Fest. Then fill in your schedule’s gaps with helpful technology-based events like Innovation Week and SlossTech. Who doesn’t want to spend an evening reliving their favorite childhood video games? Known for their rock covers of NES game soundtracks, Bit Brigade will be performing at Saturn at the beginning of the month. Sip on some local beers or a fresh cup of coffee as the band plays covers of both Zelda and Castlevania. Enjoy Birmingham’s finest food trucks (ranging from Saw’s BBQ to Big Spoon Creamery) and local drinks at the 2nd Annual Red, White & Brew. Located at Avondale Brewing Company, the event will feature fireworks and live performances, with proceeds benefiting Birmingham Education Foundation. Celebrate America’s independence with a multitude of events. Visit the Vulcan and take in a spectacular light show at Thunder On the Mountain or check out the Birmingham Zoo and get free entry if you’re a veteran or active military. Some cities and counties will also have local 4th of July festivals and fireworks shows. Since it’s mid-summer, the majority of farmers’ markets will be in full swing. Spend your Saturday morning perusing local produce and goods from various vendors. Try visiting the Valleydale Farmers’ Market, Mt Laurel Farmers’ Market and Craft Fair or hit up Pepper Place Market. Get excited for the beginning of Innovation Week with a happy hour at Iron City. Birmingham Innovation Week is meant to showcase transformational ideas in the Magic City through an entire week of community-focused events. Use the Kickoff Party as a chance to learn about the week’s offerings and mingle with partners. Listen to thought-provoking speakers and attend helpful workshops at Sloss Tech. This one-day event teamed up with Sloss Music Festival as part of Innovation Week to provide an entertaining and educational weekend in Birmingham. Sloss Tech’s speakers this year include Bozoma Saint John (Chief Marketing Officer at Endeavor), Payne Lindsay (CEO at Tenderfoot TV) and more. Get your tween or teen (anyone in the 4th-12th grade) a head start in the STEM field with a coding class. Hosted by the Homewood Public Library, this hour-long class will cover the basics of how to start working with code. Bringing a laptop is recommended, but not required. You like puppies, you like wine, why not combine the two? Join Shelby County Humane Society at their 9th Annual Bark and Wine Gala. The event will take place in the Grand Bohemian Hotel and features food, drinks and a live auction of work from local artists. The event will benefit Shelby Humane’s spay/neuter program that provides free or reduced cost surgeries. Get your geek on at Hoover Public Library’s SciFi/Fantasty Fest. The weekend-long festival, presented in partnership with Kingdom Comics, will feature guest authors, artisan workshops, themed panels and more. Dress up or just show up for a good time discussing everything from Game of Thrones to Dr. Who. Pull out your tube socks and sweat bands; it’s time to go retro for this running event. The Trak Shak Twilight Retro Run will take place in downtown Homewood. The walk/run 5K will have a retro costume contest afterwards, and a local DJ will be playing the greatest hits from the ’70s, ’80s and ’90s.